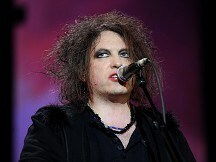 The Cure have been nominated to join hundreds of other music legends in the Rock and Roll Hall of Fame. The Goth rock band, whose hits include Why Can't I Be You? and Friday I'm In Love, have been shortlisted along with acts including the Beastie Boys, Donovan and Donna Summer for entry next year. Mod legends the Small Faces are also nominated in a joint entry with the Faces - the name the band took when lead singer Steve Marriott left to be replaced by Ronnie Wood and Rod Stewart. Rod is already a member of the Hall of Fame in recognition of his solo career, while Ronnie was inducted as part of the Rolling Stones. They are among 15 nominees which include veteran blues man Freddie King and Guns N' Roses. The shortlisted acts are chosen by a committee at the Hall of Fame who then ask around 500 rock experts to vote for who they want to see inducted. Between five and seven of the nominees are likely to make it into the Hall of Fame at a ceremony in its Cleveland, Ohio, home on April 1. An act must have released its first single or album 25 years ago to qualify for induction. The Hall of Fame was set up in 1983 to "recognise the contributions of those who have had a significant impact on the evolution, development and perpetuation of rock and roll".